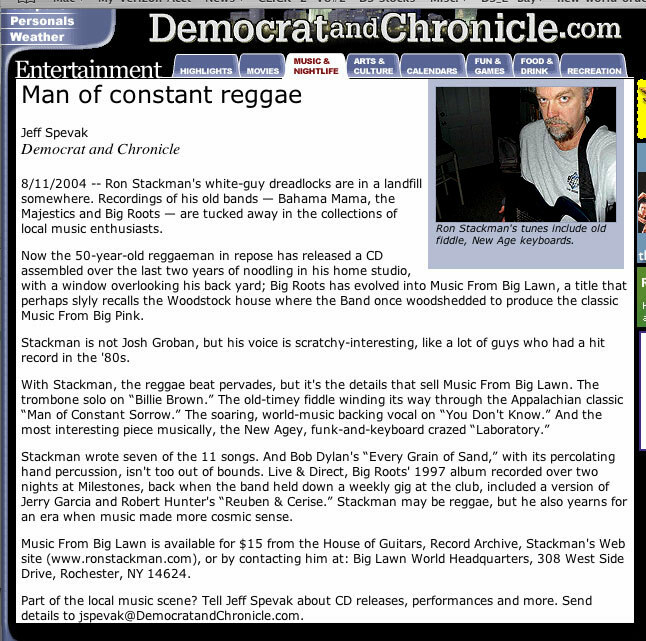 I've been a Ron Stackman fan for 20 years, ever since I moved to Rochester from the Midwest to write about music for the now-defunct and much-lamented Times-Union. 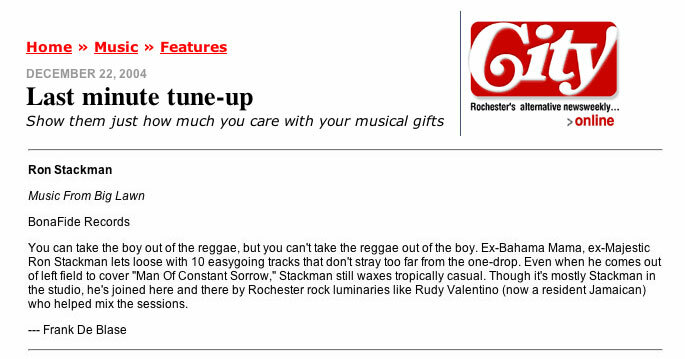 I never lost my taste for the changes that Ron and his various musical cohorts worked on the whole rock-reggae nexus. Now comes "Music from Big Lawn (and let me tell you: It really IS a big lawn), Ron's solo project that folds in a variety of accomplices from his various other groups over the years. 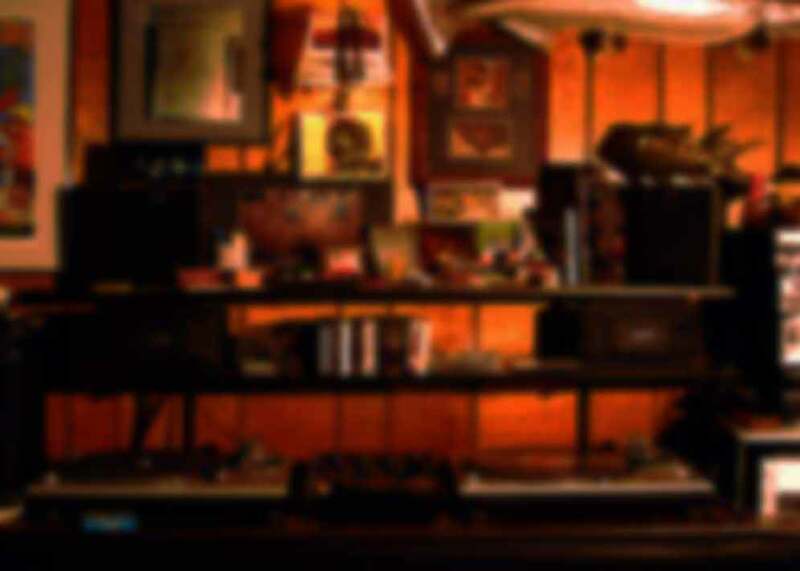 But front and center is Ron himself, with his always intriguing blend of old and new school, put together in his home studio with a little help from his friends. Ron's musical background - from Bahama Mama to the Majestics to Big Roots - combines a deceptively propulsive blend of island rhythms, roots, funk and good ol' American rock'n'roll. He has his own sound, one built on his diverse tastes and solid musicianship. On this CD, he plays most of the instruments himself, aided by such worthies as Rudy Valentino on guitar, Jim Schwarz on bass, Dave Cohen on drums and John Kralles on guitar. Listen to the insinuating "What's My Name? ", with Ron's slightly scratchy tenor, asking the unanswerable questions about a relationship gone wrong, while John Kralles' guitar snaps and bites on the break. Yet his voice can move into a higher register, with an imploring quality on songs like "For So Long" and Bob Dylan's moving "Every Grain of Sand." The musical influences run the gamut from Middle Eastern to roots reggae, with bits of dub and folk and even country-western. Listen to his version of "Man of Constant Sorrow," the "O Brother, Where Art Thou?" hit, which Ron puts through the Jamaican blender, spiced with an oh-so-tasty bit of fiddle filigree by Taylor Buckley. "Don't be thinking life is a mystery," Ron sings on "Thing to Do." "Life is not a mystery/ nothing is new." And yet he takes an old Majestics' tune, "I Hear You Calling," and tricks it out with a horn section and a rolling rhythm that could be straight out of Otis Redding, even with the reggae beat. On "Laboratory," he pulls out a heavy Lee Perry bottom, then mixes in stinging guitar lines and a jazzy piano, and that ís not to mention the muezzin-style backup vocals. Marshall Fine is national film correspondent for Gannett News Service and the author of "Bloody Sam: The Life and Films Of Sam Peckinpah," "Harvey Keitel: The Art of Darkness" and the forthcoming "Accidental Genius: How John Cassavetes Invented the American Independent Film."